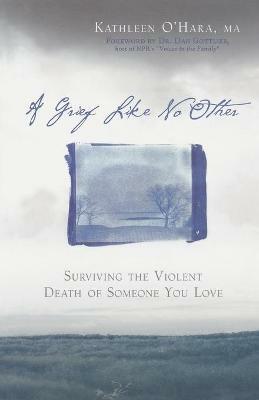 A Grief Like No Other is the book no one wants to ever have to buy; sadly, many people continue to need it. From 9/11 to Cindy Sheehan's son - from mass tragedies like the recent London bombings to Law and Order type crimes that make the news only to be replaced by another name. As such, more people are left with the aftermath of dealing with the violent death of a loved one. It brings its own special brand of grieving since victim's families can spend years dealing with legal ramifications, guilt, and a myriad of other circumstances that don't accompany "normal" deaths. Kathleen O'Hara knows both sides of this coin. As a therapist, she has counseled hundreds of people dealing with grief. As a mother, she saw her worst fears realized when her college-aged son was brutally murdered in 1999. In the aftermath of Aaron's murder, O'Hara developed the seven stage journey that is at the heart of A Grief Like No Other. Although this is a book for those left behind in the aftermath of violence, it offers concrete and practical steps and stages, allowing family and friends safe passage through this incredibly harrowing journey. Kathleen O'Hara, MA is a therapist who received her BA in Psychology from Antioch University and her graduate degree in Psychology from the California Institute of Integral Studies. O'Hara lives in Philadelphia.